Things have gone from bad to worse for Senator Mike Frerichs. He launched his campaign yesterday (remember..even Bill Clinton weighed in!) and things have gone south since. Rich Miller, at Capitol Fax has taken notice that the Frerichs for Treasurer Campaign has had to take down their announcement video. Because, in it, Mike lied. In his video, he claims that he was a big boy and was a leader by working to end 'free lifetime healtcare for legislators.' Unfortunately for Mike Frerichs, he actually voted against that bill. Bummer for him. At least the video product guys get a few bucks out of the deal for having to cut another video. But, really, the goofiest thing about this mistake is that Frerichs has been running for treasurer for a year now. He’s had all this time to prepare the “perfect” official rollout and he blew it. That’s a seriously amateur mistake for a guy who claims to be running a top-notch campaign. There’s just no excuse for this stuff. And, remember folks. 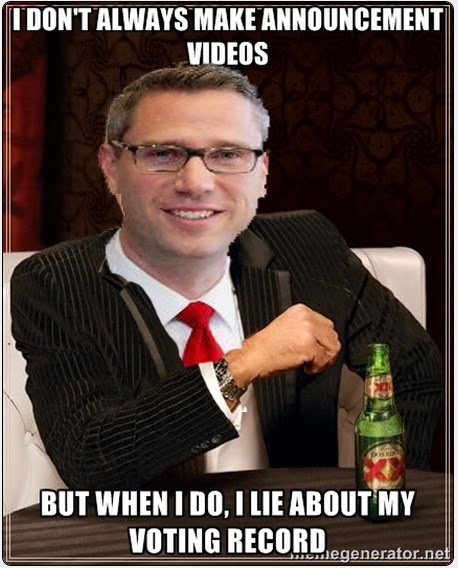 This guy - Mike Frerichs...who in his *announcement video* isn't telling the truth wants to be your latex salesman Illinois State Treasurer.